Aarathu Sinam comes off as an extremely well made psychological thriller/whodunit. Verdict - Aarathu Sinam is such a honest, jubilant and breathtaking reprisal of the original that leaves no strings untouched from "Memories"
Barring the fact that this is an out and out remake of Jeetu Joseph's "Memories", the film is indeed one of the brilliant thrillers made under Tamil Cinema's canopy till date with a tinge of romance, drama and neo noir by director Arivazhagan after his impressive showdowns with "Eeram" & "Vallinam". The pacing was at its finest in this thriller, allocating equal time for character development and, in its second half, where it transitions into a good thriller. The second half was more akin to a true whodunnit mystery which keeps you guessing till its revelation in the finale. Here he scores full marks by tweaking the original and taut screenplay to suit the Tamil audience with a bit more added melodrama (which actually worked the other way over a point, to be honest). The characters who are warm and humane, bringing out the emotions as exactly as it could. In the performances, Aishwarya Rajesh, Radharavi were flawless. Brownie points to the antagonist too, for sustaining the tension even after revealing the well kept suspense (I wouldn't want to tell his name here :P ) The others are good and Arulnidhi churns out yet another brilliant performance after a spate of his marvelous performances in films like "Demonte COlony, "Mouna Guru" etc. Especially the flashback sequences are conceived rather exquisitely, all thanks to some little miniscule improvizations. Hats off to Arulnidhi's ballsy script selection at this point of his career. The brilliant editing by Rajesh Kannan.S plays a pivotal role in maintaining the chills and thrills in some of the scenes. In particular, the transitions and cus were unparalleled. The music score by Thaman which is equally instrumental in setting up the intensity of the movie. Cinematography by Aravinnd Singh is awe-striking to say the least. Lighting techniques deserve special mention which proves to be a delightful watch. The flaw in the film, lies in the melodrama, the dialogue scenes which could have been crisper and the minute expressions of Arulnidhi which actually somewhere, look a bit artificial while donning the drunkard look. Also the entire Robo Shankar track was in vain as it invoked no giggles whatsoever. Epic fail. Nonetheless, Aarathu Sinam comes off as a plain thriller with no frills attached that never goes over-the-top neither does it fail to entertain you at any point. Hats off to Director Arivazhagan and team for stepping up to remake this one and justified it to a huge extent. And boy-oh-boy! Director Jeetu Joseph is such a revelation who can write scripts with international appeal. I wont be surprised if this is remade into more languages! Aarathu Sinam is a decent remake of Malayalam super hit Memories. The problem is of course the casting, especially one can't accept Arulnithi in the shoes of the efficient Prithviraj. Also, Memories is an old script and hence, the twists and turns are not acceptable for the current situation. In fact, the back story and villain characterizations are very weak. We know that the hero is an alcoholic but he was a talented investigative cop. The thing is there are scenes for his reason behind the addiction towards alcholol but there weren't any flash back scenes for his mettle in investigation. The sudden intelligence of the hero is unbelievable and the villain role played by Gaurav Narayanan is a bad choice. The plus point in the film is the first 30 minutes in the second half with quite a few brainy moments. Arulnithi is known for choosing some of the good scripts in recent times. He has made sure he goes to the next step with AarathuSinam once again. Being directed by Arivazhagan of Eeram and Vallinam fame, he is known for the intensity in his screenplay. Produced by ThenandalFilms who are the leading producers in tamil cinema. AarathuSinam is all about a drunkard cop who is given a case to indentify and arrest a serial killer. Why does he become a drunkard ? Was he able to identify the serial killer ? What happens in the case is the film. The screenplay is so intense that the film never deviates from the plot any point. The director has presented this film without any unwanted commercial elements which is good. And it is Arulnithi who impresses with his performance, both as a tough cop with family values and as a drunkard cop. Aishwarya Rajesh, though has a small role to play, is cute and gorgeous as a wife and mother and adds value to the storyline. The characters are limited and have been well played. Technically, cinematography, songs and BGM by Thaman are brilliant. First half is bit slow paced and the repetitive falshback are the only negatives, without which the movie is perfect. Aaraathu Sinam is a faithful remake of Malayalam hit 'Memories' with a calculated fine-tuning that is much needed to suit the sensibilities of Tamil audiences. There are minute details in the film which are specifically different from the original and they are staged too well. However, somehow the soul of the original is missing somewhere despite the close-knit proceedings with which Arivazhagan has written the screenplay. Arulnidhi plays the role of an alcoholic cop and excels in his performance effortlessly. Whenever he is made to look helplessly inebriated, he shines with his expressions and gestures. Aishwarya Rajesh, who appears in the superbly inter-cut flashback portions, is a beautiful natural. She fits the bill as the doting housewife and leaves an impact with the viewers. a very well made crime thriller! Aarathu Sinam is said to be a remake of the Malayalam thriller memories but Arivazhagan had made lot of changes especially in the emotional aspect of the film. plot is quite straight forward. there will be a series of mysterious murders happening and the police notice a pattern and they appoint our hero to solve it and he does in the end. Though the plot is simple, I liked the screenplay. 1st half takes its time settle and establish the hero's character and his past family life and at the same time the murders keep happening. 2nd half is where majority of the thrill happens. the hero decodes the mystery and the cuts were just too sharp. I loved the editing in the 2nd half. the way the film moves is too good. for a change, I liked thaman's music, though it was repetitive and gave a deja vu feeling. his music gave life to the sharp and racy cuts in the 2nd half. I loved the movie for its editing on the whole. 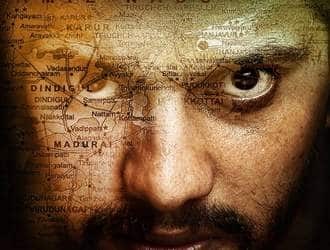 Arulnithi has once again proved that he is focused in doing good scripts rather than doing commercial films. he was pretty good in the investigation scenes but was a bit off in the emotional department. Robo Shankar and Charlie duo provided some comic relief at times. Aishwarya in a small role was good.